Astro Pi upgrades launch today! Before our beloved SpaceDave left the Raspberry Pi Foundation to join the ranks of the European Space Agency (ESA) — and no, we’re still not jealous *ahem* — he kindly drafted us one final blog post about the Astro Pi upgrades heading to the International Space Station today! So here it is. Enjoy! We are very excited to announce that Astro Pi upgrades are on their way to the International Space Station! 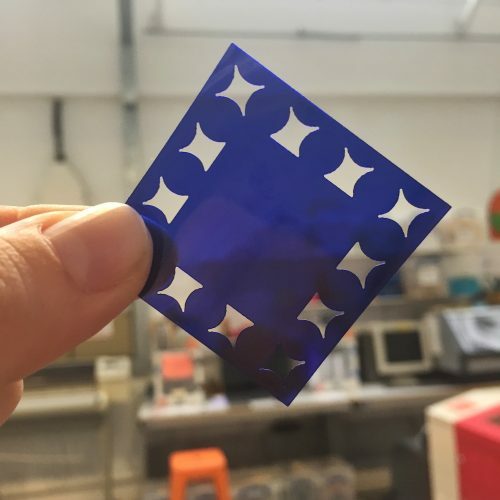 Back in September, we blogged about a small payload being launched to the International Space Station to upgrade the capabilities of our Astro Pi units. For the longest time, the payload was scheduled to be launched on SpaceX CRS 14 in February. However, the launch was delayed to April and so impacted the flight operations we have planned for running Mission Space Lab student experiments. To avoid this, ESA had the payload transferred to Russian Soyuz MS-08 (54S), which is launching today to carry crew members Oleg Artemyev, Andrew Feustel, and Ricky Arnold to the ISS. You can watch coverage of the launch on NASA TV from 4.30pm GMT this afternoon, with the launch scheduled for 5.44pm GMT. Check the NASA TV schedule for updates. The pictures below show the flight hardware in its final configuration before loading onto the launch vehicle. 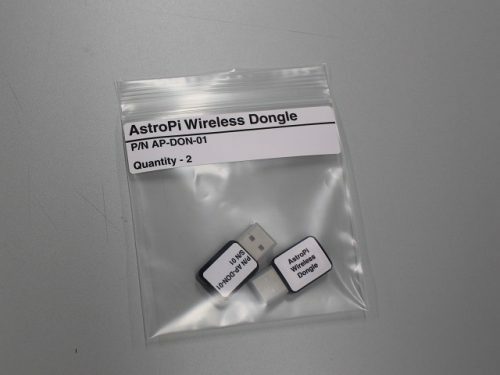 With the wireless dongle, the Astro Pi units can be deployed in ISS locations other than the Columbus module, where they don’t have access to an Ethernet switch. We are also sending some flexible optical filters. 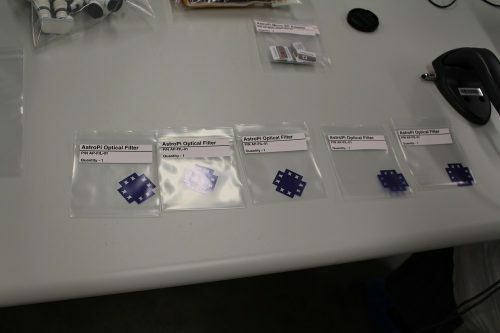 These are made from the same material as the blue square which is shipped with the Raspberry Pi NoIR Camera Module. 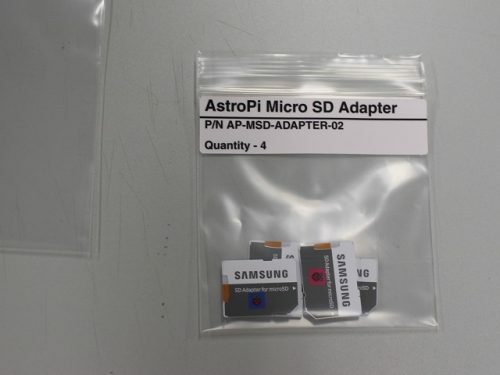 So that future Astro Pi code will need to command fewer windows to download earth observation imagery to the ground, we’re also including some 32GB micro SD cards to replace the current 8GB cards. 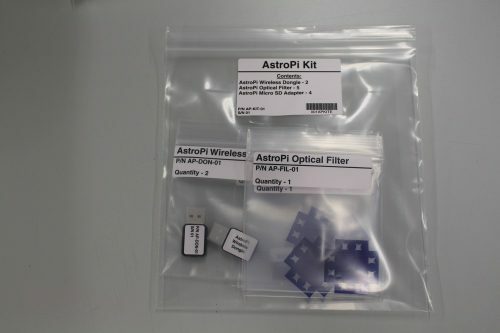 Tthe items above are enclosed in a large 8″ ziplock bag that has been designated the “AstroPi Kit”. Once the Soyuz docks with the ISS, this payload is one of the first which will be unpacked, so that the Astro Pi units can be upgraded and deployed ready to run your experiments! Stay tuned for our next update in April, when student code is set to be run on the Astro Pi units as part of our Mission Space Lab programme. And to find out more about Astro Pi, head to the programme website. I’m beyond excited about this. One presumes a software upgrade as well. Are the Astro Pis switching to Stretch, or did that already happen and I managed to miss the news? I’m not 100% sure about this, so don’t quote me, but I think the Astro Pis on the ISS run a very specific flight-certificated version of Raspbian, and I think the certification process is onerous enough that it’s not worth updating it. So I doubt they are getting the Stretch update. Do you plan to ship the new pi 3b+ at some time in the future? Would all the new shielding on the new pi make it run better up there? This whole Astro Pi endeavor is beyond amazing. It surely must be so incredible inspiring for the kids, congratulations to everyone involved! I have been following this from the first blog post about the idea, and each update proves the goals of the project to be of the highest order. Since the start the thought of a resource like this for young students has taken my breath away.